7/12/12 - Acquisition - Chambord, Domaine national - The Domaine national de Chambord recently acquired a tapestry from the Months series, also known as the "Maisons royales", made up of twelve pieces, from the Chevalier gallery. The ensemble was produced by the Manufacture des Gobelins between 1666 and 1669, directed at the time by Charles Lebrun who designed the models and entrusted the execution of the cartoons to different artists, Van der Meulen for the landscapes and small figures, Pieter Boel for the animals, Yvart the Father for the larger figures... A group of drawings from the circle of Adam Franz Van der Meulen representing a zodiac calendar inspired by this series had in fact come up at auction on 6 July 2001 at Tajan’s. Each month shows a corresponding sign from the zodiac along with one of the royal residences - the Louvre, the Palais royal, the château de Madrid, Versailles, Saint-Germain-en-Laye, Fontainebleau, Vincennes, Marimont, the Tuileries, Blois, Monceau - and accompanied by a form of entertainment at court - opera, ball, stroll but especially hunting. This ensemble is particularly decorative with secondary figures, silver items and animals in the foreground between the columns or in front of a low wall while the composition opens up in the distance revealing a vast landscape and a monument, with the court figures reduced to small shapes busily distracting themselves. 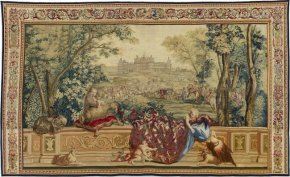 But this tapestry series also contains a political dimension depicting Louis XIV as the worthy successor of the great kings before him , not only the Bourbons but also the Valois and the Capétiens who built all of these royal residences. The month of September, represented by the sign of Libra, associated precisely with the château of Chambord has just joined the domain collections. This residence is closely linked to François I and was transformed by Louis XIV. The acquisition is particularly interesting since the building is represented in the state after the intervention of Jules Hardouin-Mansart but before the changes of the 1730’s. The serie was woven several times until the 18th century and completed with "entre-fenêtres" (long and narrow panels). Fenaille notes two tapestries woven in high warp in gold, six in low warp in gold although the piece acquired by Chambord was not listed in the Etat général des tapisseries de la manufacture des Gobelins and was probably a private commission woven at the Gobelins. It has been restored and will hang in the first ante-chamber of the 18th century ceremonial apartment on the first floor, starting on 9 December. The months of the year are also found on other tapestry series of course, such as the famous Maximilian’s Hunts or The Lucas Months whose name comes from the presumed author of the models, still wavering between Lucas Cornelis, Luca de Olanda or even Lucas de Leyde ; the original tapestry was produced in the 16th century in Brussels and we know that Louis XIV owned a replica since the Gobelins wove several versions. Read Jean Vittet and A. Brejon de Lavergnée, La Collection de tapisseries de Louis XIV, 2010.